Bengal tigers are one of the most recognized animals on the planet. It is loved by many people, but some people fear the tiger because it has been know to occasionally eat humans. They are easily remembered for their beauty, grace, and sense of power. They have an amazing coat of fur that is quickly recognized by orange fur and black strips coming down the sides. The tiger is one of the greatest hunters on the planet. Every feature on the tiger allows it to hunt perfectly in its environment. An average male tiger weighs around 420 pounds and is about 9 feet long. That’s including a tail that is about 3 feet long, making the body actually only about 6 feet long. A female tiger is only 300 pounds and 8 feet long. 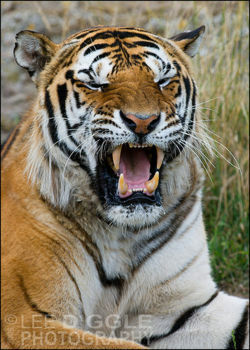 Tigers are incredibly strong and are able to drag victims much heavier than itself, near 500 pounds, almost half a mile. A tiger’s coat can actually take on a variety of colors. The standard colors are a orange body with black stripes coming down the sides. 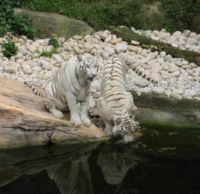 The two most common variations are the white tiger and the golden tabby. The white tiger is white with either brown or black stripes coming down the sides. The golden tabby is a whitish yellow color, with amber stripes coming down the sides. They have large fangs for killing and maiming prey. They also have large, retractable claws that allow them to climb and kill prey. A female tiger usually has her first cubs at about 3 or 4 years old. Gestation in a female tiger usually lasts about 3 or 4 months. After this time she gives birth to an average litter of about 2 to 5 cubs. It is not unusual though to have as many as 6, or only one. Newborn cubs are blind at birth and weigh about 2 or 3 pounds. Tiger cubs are playful at birth and retain a curious nature throughout life. From the time of birth until one year, tiger cubs are also completely dependant of their mother for nutrition. At the age of one year, they are able to kill smaller prey, but are still very vulnerable to larger predators, such as hyenas and lions. At the age of 2 years, the cubs become fully independent. Male cubs leave their birthplace and start off to find a area of their own. Female cubs generally stay in the same vicinity as their mother. Wild tigers are found on only one continent: Asia. Before the 1800’s, many tigers roamed throughout Asia. After extensive poaching and habitat destruction, there are only a few tigers in the world. Tigers are one of the most adaptable animals on the planet. All they need to survive is shelter, water and prey. They can live in rainforests, deserts, and snowy mountains. A major thing that helps tigers adapt is shade. Unless they are hunting, tigers spend most of the time in the shade. This page was last modified on 7 March 2014, at 15:48.